Hello readers! 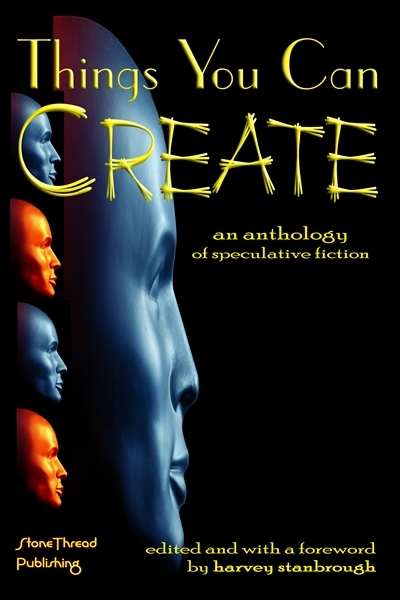 I know I said I’d be discussing the married life of two writers in this next blog, but it appears I’ll have to push that back in honor of the early release of Things You Can Create, the speculative fiction anthology released by StoneThread Publishing containing my short story of the same name. You can purchase the book, which is being released in e-book format only, here. So, in honor of the release, I’m participating in another blog hop, the purpose of which is to introduce all you readers to the talented team of writers behind the stories in this anthology. You can find the blog introducing this blog hop and a list of all of the authors who will be participating, as well as their blogs, here. Enjoy the blog hop and this brief Q&A about my story. Q: What is the title of your story? Q: Describe your story in one sentence. A: A successful but bitter writer faces surprising consequences when she decides to kill off her main character’s love interest. Q. Where did you get the idea for the story? A: Writers all grow very close to our own characters. They are our creations and they start to feel like friends and enemies. They certainly begin to feel real. The idea for this story came after a few too many cups of caffeine and a few too many hours torturing the main character of my novel. At 2 in the morning, it’s easy to imagine anything – “My character would kill me for this!” isn’t much of a stretch. Q: If your story was optioned for film, what actors would play the main characters and why? A: That’s a tough question. I have favorite authors in many genres. I love Orson Scott Card for his ability to think very far outside of the box, Kelley Armstrong for her ability to show the human condition in sub-human circumstances, Matthew Warner for his disturbingly accurate attention to detail, Suzanne Collins for her ability to make grandiose topics completely relatable, and Veronica Roth for the cadence of her writing voice. And Joss Whedon for just everything. Does Joss Whedon count? Q: What else about this story will enthrall readers? A: If you like “The Twilight Zone”, you’ll appreciate what this story has to offer you. I’m no Rod Serling (nobody is), but there is a definite spooky feel to the piece that is very similar. In that vein, it is much more of a character study of our writer, Kelly, than it is a suspenseful thriller or an action story, although this does contain elements of that as well. A: I have two more short stories completed, both of which are not genre fiction, but literary fiction. I am currently shopping those out. I have a third in edits. I’m also working on the novel I discussed in my blog last week as well as two others that have taken a backseat, but are still in the works. Basically, I’m a busy woman. Some would say that the good I’ve done for her has done little to outweigh the bad, but I’m fine with that. Why? Because it pays to torture Juliana Collins. I sleep well at night despite the fact that her sad eyes stare back up at me from the ink-filled pages. Every time I see my name splashed across the newest Kelly Marin original, I take pride in it, despite the years I have spent torturing my hero in book after book of the “Chronicles of Heroism” series. It makes it all okay. I made her. She owes me. But lately that has changed. Lately, a lot has changed. It’s official – I’m a Published Writer! I just wanted to throw a post up here really quickly announcing the release of Things You Can Create, featuring my short story of the same title. You can find it for purchase here. Expect a promotional blog hop post from me discussing that particular short story and introducing some of the other authors in the anthology to be posted on January 15th. As always, thanks again for your constant support!